Google Watermark: The Google researches have pointed about the vulnerabilities in a photo since there are many computer algorithms which are easily available to remove the standard watermarking practise. These stock images are removed from their copyright protection and they can easily be reposted in the internet without any credit to the owner. Photographers usually post their photographs with these copyrighted water marks, so people don't use them without their permission. Tali Dekel and Michael Rubinstein, Google research scientists said,"As often done with vulnerabilities discovered in operating systems, applications or protocols, we want to disclose this vulnerability and propose solutions in order to help the photography and stock image communities adapt and better protect its copyrighted content and creations". Currently photomarking depends on the consistency of style, so the duo google researchers said,"We show that this consistency can be used to invert the watermarking process — that is, estimate the watermark image and its opacity, and recover the original, watermark-free image underneath. This can all be done automatically, without any user intervention or prior information about the watermark, and by only observing watermarked image collections publicly available online". 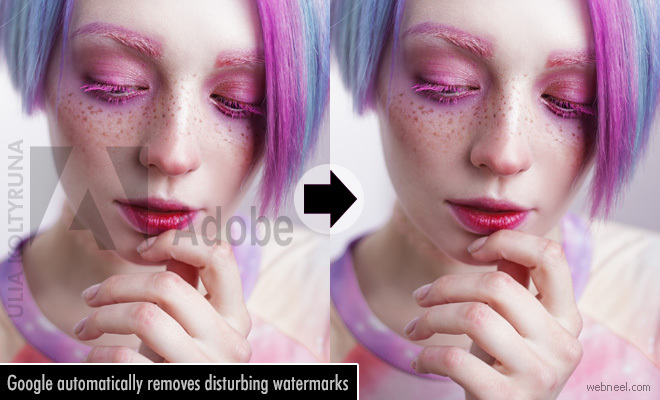 The solution to saving your copyrighted pictures is to use change the opacity level in the text, which makes it difficult to completely remove the google watermark.